In large bowl, beat eggs with electric mixer on high speed about 6 minutes or until thick and lemon colored. Add cake mix, water, oil, cinnamon and nutmeg. Beat on low speed 30 seconds; scrape bowl. Beat on medium speed 1 minute. Stir in carrots. Pour 2 1/2 cups batter into each pan; spread evenly. Place pans side by side on middle rack in oven. Bake 10 to 12 minutes or until cake springs back when lightly touched in center. Meanwhile, sprinkle 2/3 cup powdered sugar on each of two clean kitchen towels. Remove cakes from oven. Run metal spatula around edges of pans; carefully turn one onto each kitchen towel. Peel away parchment paper. Immediately roll up cake and towel from narrow end. Cool cakes on rack 30 minutes with seam centered on bottom of cake. In large bowl, beat cream cheese and 2 cups powdered sugar with electric mixer on medium speed until smooth, scraping bowl occasionally. Beat in whipped topping until blended. Carefully unroll cakes. Allow narrow end to remain slightly curled. Drop 1 1/4 cups of the cream cheese mixture by spoonfuls over each cake; spread evenly to within 1/2 inch of edges. Reroll filled cakes, using kitchen towel to help roll up cake. Remove towels. Wrap in plastic wrap, making sure seam is centered on bottom. Place both wrapped cakes on cookie sheet; refrigerate 30 minutes. Cover and refrigerate remaining cream cheese mixture. Remove cakes from refrigerator; unwrap, and place on serving platters. Remove cream cheese mixture from refrigerator, and uncover. Frost sides of each cake with 1 cup of mixture; sprinkle pecans on top. Store covered in refrigerator. Cake roll cakes bake up soft and flexible so they can be rolled up. Be sure to slowly and carefully unroll cakes after cooling for 30 minutes. Small cracks may appear when unrolling cakes but are easily covered with filling when rolled up again. To keep your serving plate clean while frosting the cake rolls, place strips of waxed paper around edge of plate. Remove after frosting and sprinkling pecans are complete. 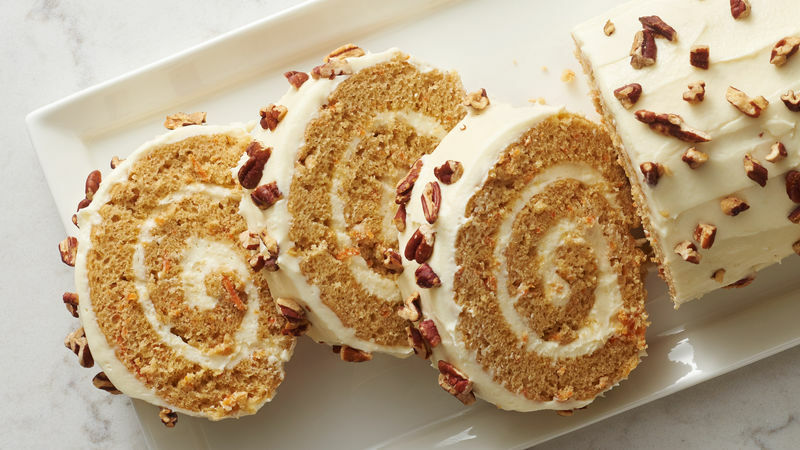 For a special touch, toast the pecans before sprinkling on cake rolls. To toast pecans, heat the oven to 350°F. Spread pecans in an ungreased shallow pan. Bake uncovered 6 to 10 minutes, stirring occasionally, until light brown.